The symposium was an opportunity for researchers and students of the two SSHRC-funded partnership projects, OceanCanada led by Rashid Sumaila, UBC and Too Big To Ignore (TBTI) lead by Ratana Chuenpagdee, Memorial University, to share research findings and exchange ideas about sustainable fisheries and oceans. The half-day event was packed with presentations by leading fisheries scholars, including Daniel Pauly, Svein Jentoft, Moenieba Isaacs, Derek Johnson, Jose Pascual and Yoshi Ota, which followed the overview presentation of the two projects by Rashid and Ratana. Another highlight of the symposium was the excellent research talks by graduate students in the two projects, namely Darah Gibson and Sarah Harper of OceanCanada and Neil Laddell and Anna Schuhbauer of TBTI, covering various aspects of small-scale fisheries in British Columbia and elsewhere. 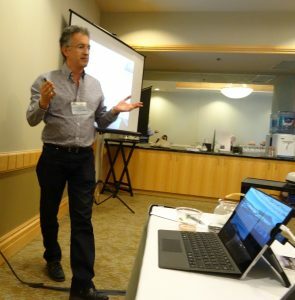 About 40 people attended the symposium and the presentations generated lively discussion, exhibiting the importance of social science research in fisheries and oceans.